What’s good? 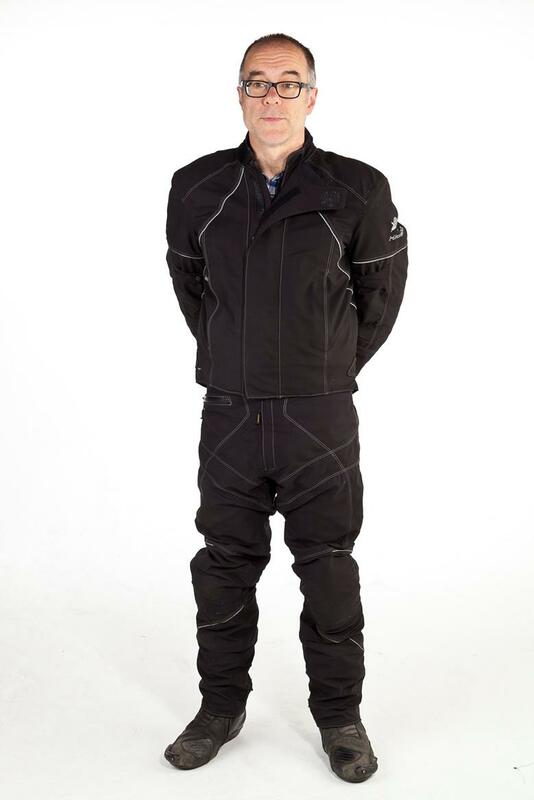 One look at the price tells you this suit belongs among the poshest winter protection gear, alongside Halvarsson and Rukka. I hasten to say I didn’t pay for it myself – I got it second hand and asked Hideout to alter it to suit me (bigger diameter arms, smaller diameter legs) for £140. It’s made from a breathable, Kevlar-weave outer material that repels water, and the seams are sealed after sewing or repairs. The whole thing feels soft and fairly light, so it’s easy to put on and very comfortable – you don’t feel like you’re clambering into a spacesuit. It’s clearly been designed by people who ride bikes: cuffs fit over gloves, and you can do the cuff zips up with gloves on. The tailored, zip-together fit means it doesn’t catch the wind much. The trousers have leather on the bum. The body armour is comprehensive and high spec, and the tight-ish fit means it should actually stay in the right place in a crash. Warmth is pretty good: I recently did 150 motorway miles at 7-9ᵒC wearing just a T shirt and shirt underneath. I was chilly but OK. Adding a body warmer makes all the difference. What’s not? It’s very expensive – but MCN’s Adam Child, who commutes between Peterborough and Hull, reckons Rukka make the best suits, and a Rukka Navigator jacket alone is £1000.